Update: The gunman who opened fire during a Madden 19 video game tournament in Jacksonville, leading four dead including the suspect, has been identified as 24-year-old David Katz, the Inquisitr reports. According to Fox News' Rick Leventhal, Katz was described as a "disgruntled gamer reacted to losing with violence", killed self. 3wks shy of 21st bday. There was subsequent confirmation from official sources that David Katz, 24, of Baltimore was indeed the shooter. The police added that the shooter used at least one handgun. Separately, according to WJXT's Vic Micolucci, Katz was described as a white male, early 20s, believed to be from Baltimore area, used semi-automatic handgun, appears to have acted alone, and killed himself inside, however his name has not yet been officially confirmed. As reported earlier, the shooting took place at a video game tournament for Madden 19 at The Jacksonville Landing, an entertainment complex in the Florida city. The event was being held inside the complex at the GLHF Game Bar in Chicago Pizza. The Jacksonville Sheriff’s Department confirmed that suspect David Katz was dead at the scene, and they initially searched whether there were any other shooters before reporting that Katz had acted alone. He reportedly took his own life. Earlier, the LA Times reported that the suspect was competing in the Madden 19 tournament and had lost a match. Javaruski said that he saw the suspect kill two or three people. Eyewitnesses at the tournament reported on Twitter that David Katz had just lost a match before the shooting begun. According to the event’s Facebook page, it was a $5,000 tournament where the winner could qualify for a national tournament sponsored by Electronic Arts, the company that makes the Madden series, the Inquisitr reports. EA Sports posted a statement after the shooting saying they were working with local authorities. 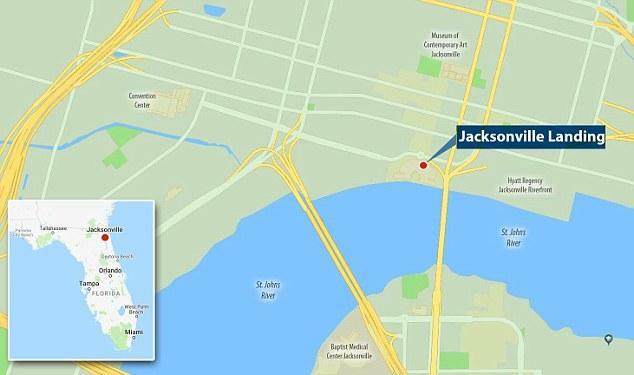 A lone, white male gunman is among the multiple fatalities after a mass shooting broke out at an online gaming tournament in Jacksonville that was partially captured on a livestream feed of the contest. Four people are dead and 11 wounded News4Jax reports, after the shooting inside a game room at the Chicago Pizza restaurant in The Jacksonville Landing area of Jacksonville, Florida, where a Madden 2019 Tournament was being held at the time. Witnesses said the shooter was a player who had just lost in the tournament. A witness told CNN he saw the gunman shoot multiple people before killing himself and that it appeared he had a laser on the gun to help him target victims. Jacksonville Sheriff Mike Williams said at 4:30 p.m. that the gunman, a white man, is dead, but wouldn't confirm casually counts, so it wasn't known if the four dead included the shooter. He said there are no other outstanding suspects in the shooting and said that the Sheriff's office is still working to identify the suspect. He confirmed there were multiple fatalities and injuries. Williams said SWAT teams had completed a methodical search of Landing and the immediate area and found no additional gunmen. 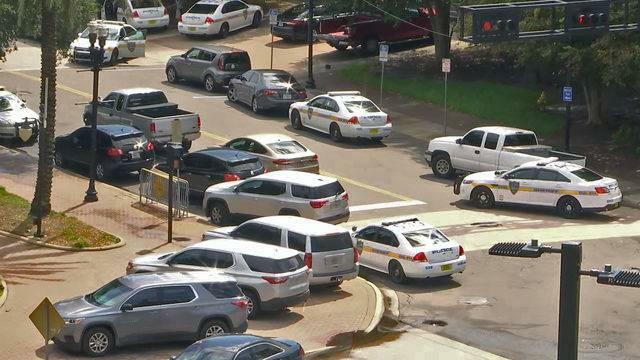 The wounded victims have been taken to Memorial Hospital, where three victims were in stable condition, and UF Health Medical Center, where one person with serious injuries and five more in good condition. 'We are finding many people hiding in locked areas at The Landing. President Trump has been briefed this afternoon on the shooting while at the Trump National Golf Club in Sterling, Virginia. 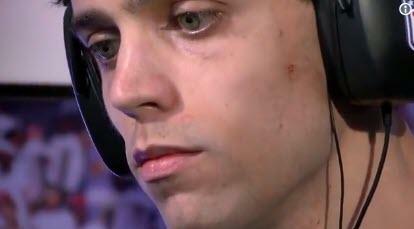 Just before the shots were heard on the livestream, a red laser dot appeared on the chest of one of the players, who was wearing white headphones and a red sweatshirt. The video of the players then disappeared. A woman who said her son inside the game room at Chicago Pizza said she he was in the room when a man pulled a gun and started shooting. "It's scary that you could be having a good time and someone just starts shooting," She said. A livestream from the gaming tournament captured the moment the gunfire broke out. The commentators could be heard going silent as the first gunshots were fired and people began screaming. The stream then cut out and a message appeared saying 'controller disconnected'. According to the Daily Mail, one gamer, Larry Legend, was shot three times in his chest and hand. His mother tweeted: 'My son was shot 3 times please keep him in your prayers'. '@oLARRY2K was shot in chest and hand I was with him. I have his bag and phone. Plz retweet this to notify 2k community. He is at Florida Shands hospital. didn’t look life threatening to me but injured bad. I love you bro,' fellow gamer BUCTILLIDIE tweeted. The councilman who represents the district in which the shooting happened said he came to the scene as soon as he heard the terrible news. Gaffney said he’s frustrated and has been talking with the mayor and sheriff about Friday night’s shooting outside Raines High School that left a 19-year-old dead. “My solution is we really need to talk about God. I’m asking the faith-based community to step up, Gaffney said. Mayor Lenny Curry and Jacksonville Sheriff Mike Williams are keeping tabs on the situation and will be making remarks later today. The Jacksonville Landing is an entertainment complex along the St Johns River, which includes restaurants and an indoor shopping mall. It was the site of a Donald Trump rally in October 2015 early in his campaign for the White House. Videos show the moment gunfire erupted (viewer discretion advised).